The new Rexton is a more premium, better built, sophisticated product than its predecessor. This is also the new Mahindra Alturas G4 SUV that is all set to come to India next month. It was a cloudy day, and I was thinking - please do not let it rain on the day I am finally driving the new SsangYong Rexton. This SUV that I was just about to drive will come to India as the new Mahindra Y400, the Indian auto giant's new flagship offering. I only had a very small window of time with the car, and any rain would have totally messed that up. It did rain while I was on my way from Seoul to SsangYong's Pyeongtaek headquarters and manufacturing facility. But as we drove in through the gates of the Mahindra subsidiary, I heaved a sigh of relief. The rain had held up! And right away I saw it. The new 2nd generation Y400 Rexton was everywhere. Yes any space I could see was filled up with brand new Rextons as the SUV maker built stock in time for the car's market debut in South Korea. The India launch, meanwhile, is scheduled for November 19, 2018. The new Rexton is a very big deal for SsangYong, and indeed Mahindra. 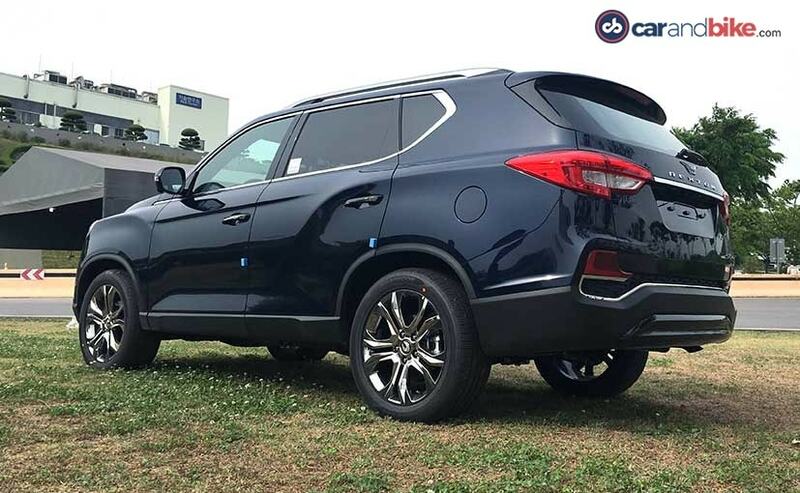 The first Rexton is the one that truly put SsangYong on the global map, and the next car simply had to be stronger, better and overall very impressive. And the new car simply has to fire – as Mahindra and SsangYong have a lot riding on its success. 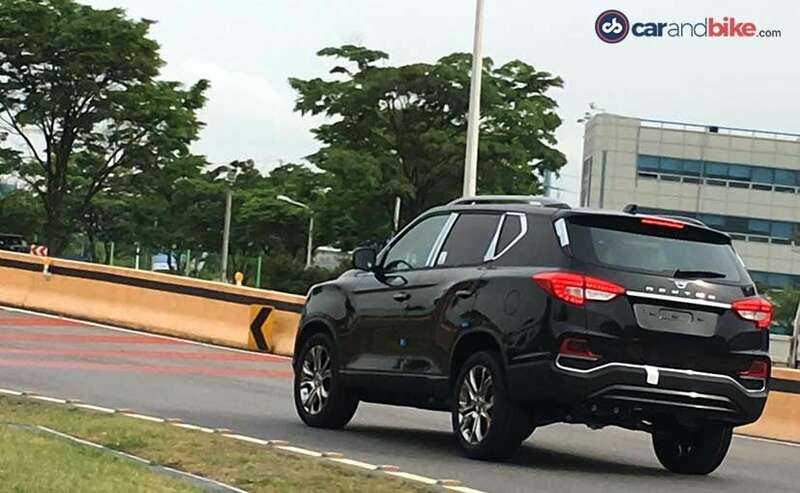 It is being called the G4 Rexton in Korea – alluding to the fact that SsangYong likes to see this almost as a fourth generation – given that the first gen went through 3 iterations. 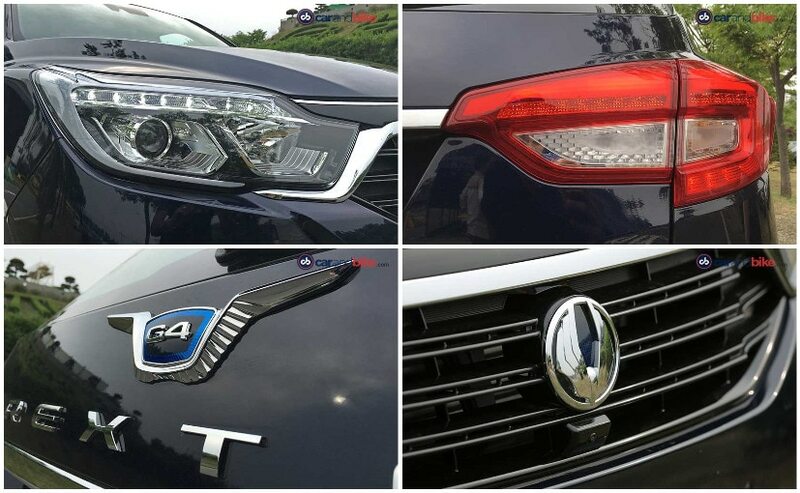 The car in fact sports a prominent G4 badge as its main logo on the rear door, while the front grille and wheels also have an updated SsangYong logo. (In Korea most of the range still uses the old ‘double dragon' logo from the co's past.) But I am still going to call this the second gen! In India, the Rexton is better known as the new Mahindra Y400 SUV, it's internal codename. The Y400 SUV will carry a completely new nameplate when it arrives. So, as you approach the G4 Rexton, the first impression you get is that it is an attractive, contemporary design. And its got the right shape, and stance, plus its proportions instantly scream fullsize SUV. The designers have gone for a sleeker, modern and contemporary look, and yet it is masculine and butch too. There are some very obvious carryovers from the Tivoli in the car's face and the flanks. The bulge along the rear fender that comes into the rear door, will most definitely tell you the two cars are related. What is also great about the car's looks, is that unlike past SsangYongs which had this quirky, Korean feel to their design, this one is very international, and the car immediately gives off a better finish and build quality too. The shut lines and paint job on the Y400 instantly impress. And for me that was heartening since this new car is a departure from the old and ageing fleet that was SsangYong a few years ago. The same feel is carried through on to the interior. 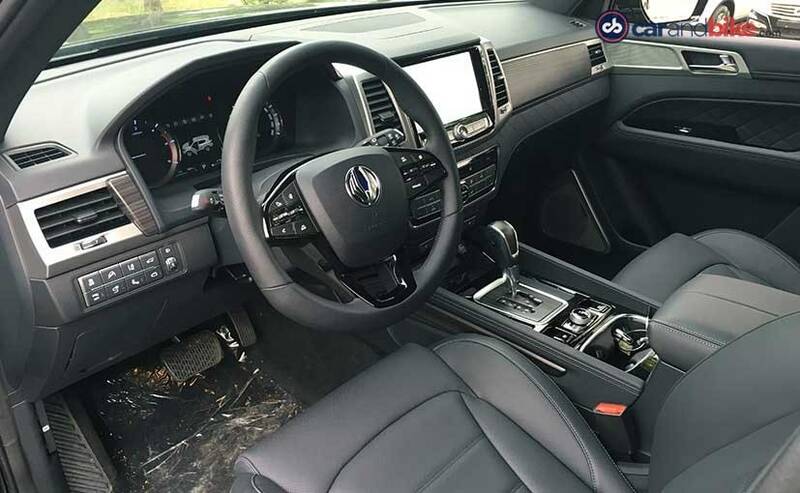 The car with me is the higher Majesty trim, and so it is fully loaded, with everything from a large 9.2-inch touchscreen to wood veneer. The matte wood is complemented by the use of polished metal and black plastics. The instrument console also features a 7-inch information display between the two dials. 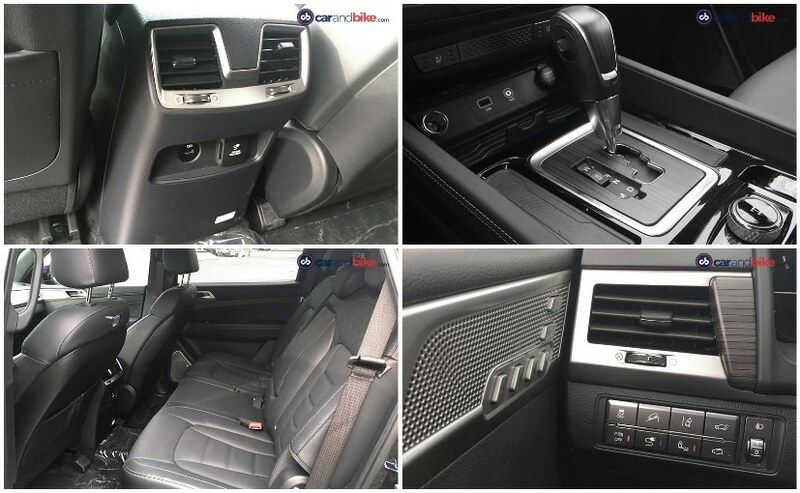 The dash and seats have a more high-end feel than the previous car's and the contouring on the seats is also well carried out. There is an enormous sense of space, and I suspect a lighter palette (yes beige would be great for India no doubt!) would do the trick to enhance that spacious feel even more. Speaking of space, the boot is cavernous, and you can collapse the 2nd row seats to create even more room. The boot has an interesting raised false floor panel – which lets you store smaller items below it – almost concealing them like a parcel tray would. Except the panel can still take up to 60 kgs of weight. Pretty neat that! The car I drove was a 5-seater, though India would likely get a 7-seater version. I am testing the variant with the new e-XDi220 or 2.2-litre turbodiesel engine. There is also a 2-litre petrol on offer which makes 222 bhp, but that is not in focus from the Indian context, and hence I've chosen to spend time with the diesel Rexton. The unit makes 183 bhp and puts out 420 Nm of peak torque. That torque kicks in as low as 1600 rpm and carries through to 2600 rpm. This affords you better driveability and allows the Mercedes-Benz sourced 7-speed auto transmission to be efficient and responsive. Even within minutes of getting behind the wheel of this car – the difference is like chalk and cheese. The first generation Rexton had managed to get reasonably refined, but still carried a lot of the clunky feel ascribed to previous generation SUVs. What's really nice is to see is that everything that was lacking on that car seems to have been methodically addressed whilst developing the new generation. And that first impression you get is really down to the much improved ride quality that will impress you. Disclaimer time here folks – as I admit that my experience with the Rexton was just on the little test track inside the SsangYong premises, and not a real world experience. But I can still vouch for the car's ride and handling. The new chassis is stiffer and more supple, and it will take some convincing to believe it's not a monocoque shell. In fact it was a bit of a gamble by the company – and a very difficult decision that was long agonized over and discussed at length. And that was whether to move the Rexton to a monocoque construction or keep it ladder on frame. The latter idea was eventually pushed through by the company's Chairman Pawan Goenka – using the logic that a true SUV still really has to be body on frame. And so like the Toyota Fortuner, and indeed even Mahindra's Scorpio, the new Rexton will stay body on frame, though it's a stiff and well built chassis that will surprise you. At cruising speeds, the new Rexton will simply glide along the tarmac, and will again surprise you by its lack of pitch or roll. The fact that there is no bounce improves on-board comfort, and also means tighter cornering as well as better steering response. 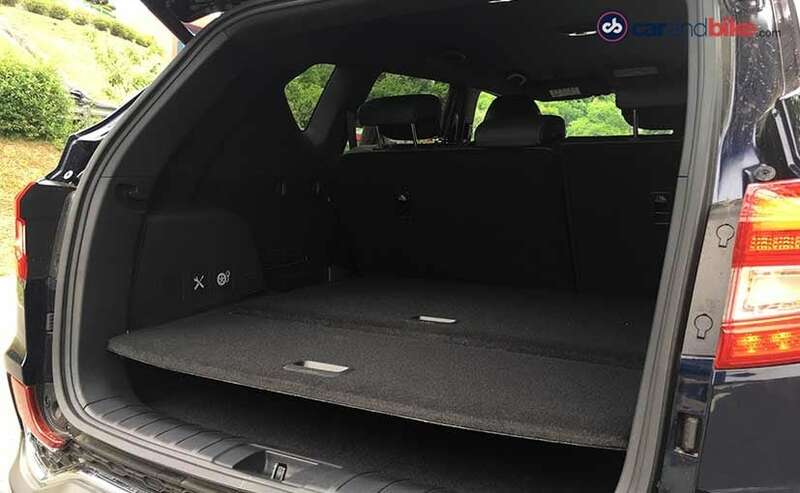 You definitely do not get a sense of the car's bulk or its 4850 mm length, unlike how you would on say a Fortuner – which is shorter at 4795 mm and yet feels bulkier. The 2.2 diesel engine is good for the role, and does the job well. This despite the fact that it really is simply an upgraded version of the previous one. 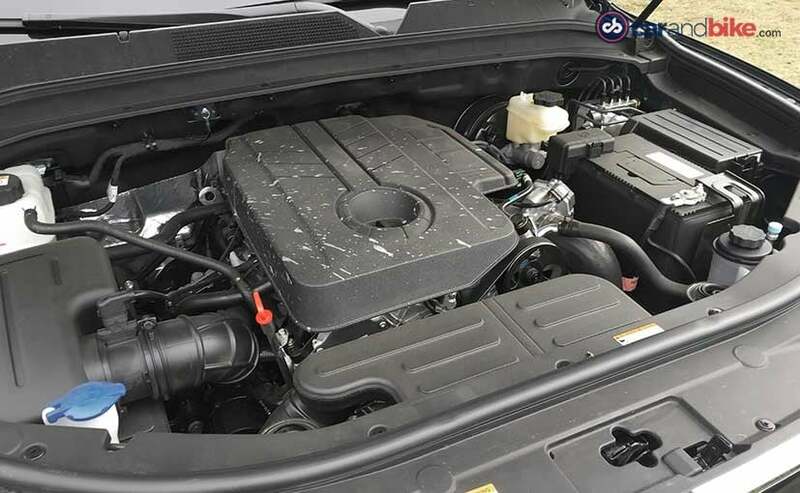 It has overcome the slightly wheezy quality that it used to have on that last Rexton W, and also does not run of breath at speeds over 120 kmph. The Rexton has the 4Tronic four-wheel drive system – another carryover from the Rexton W, but completely recalibrated. For the most part it allows the driving duties to be carried out by the rear wheels, and will send power to the front only when it encounters low-grip or slippery conditions. But it will spend most of its life on tarmac anyway given how most buyers don not really go off road. 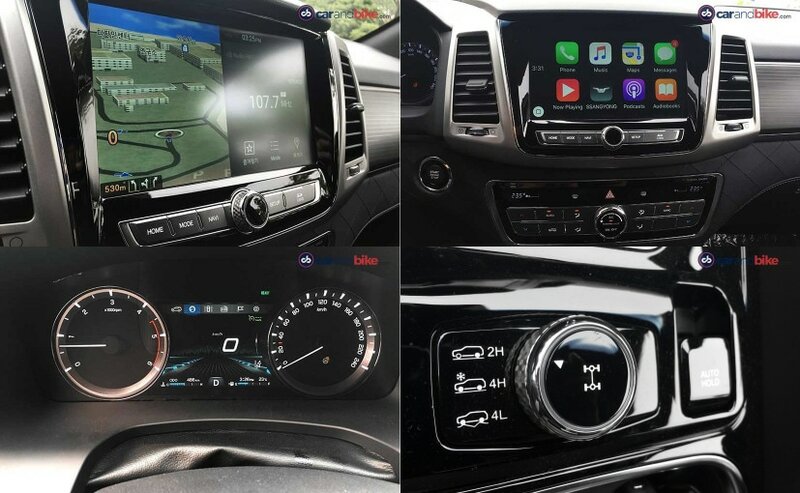 Having said that it has a dial that lets you switch to 4 wheel drive low, 2-wheel high and 4 wheel high, if you do find yourself in adverse conditions like snow for instance. The fact that there is no bounce improves on-board comfort, and also means tighter cornering as well as better steering response. The engine is married well to the new 7-speed transmission, though given how responsive it is I'd have liked the option of paddle shifters. Of course the gearbox does have a tiptronic function and so you can use that to manually shift up or down. Unlike most tiptronics, which see you needing to use the entire gear lever, here it's a small toggle switch on the side of the gearstick that lets you shift gears – and while it would take some getting used to, it is pretty cool! The new Rexton does much better than I expected. And will be a surprise compared to what you'd expect from SsangYong. It is a smarter, tauter and more practical car than the LIV-2 concept indicated it would be at the Paris Show last year. And that is why this car makes sense for Mahindra too. It will give the company a product that will not only add a larger, premium arrow to the Mahindra quiver, but more importantly showcase a more modern and globally contemporary product in terms of engineering, design and fit. 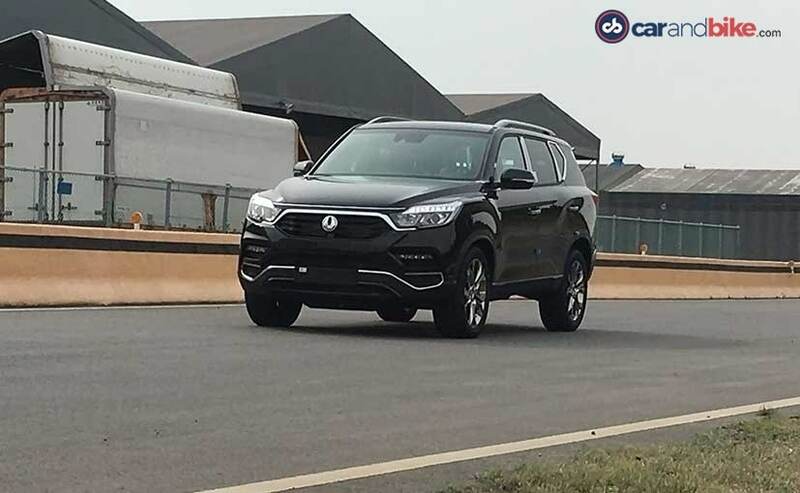 The new second generation SsangYong Rexton will indeed be launched in India but this time it will carry the Mahindra badge and not that of SsangYong. Given the tepid response to the first gen car, and indeed the brand on it, the new Rexton is being badged as a Mahindra for India. And I reckon that is smart thinking. See - all the money that would have to be spent in branding and marketing activities, plus the extras spent on a division within dealerships - can all be put back into making the Rexton very competitively priced and positioned in the Indian market. It would really have to take on the market leader, Toyota Fortuner - and take it on seriously, for any semblance of success. And at the same time it will also have to stay ahead of the Ford Endeavour, Hyundai Santa Fe, Mitsubishi Pajero Sport, et al too. 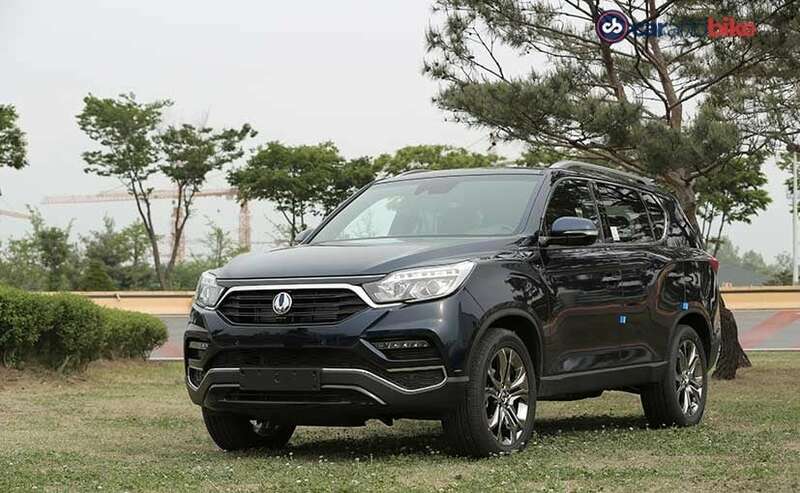 SsangYong does not consider the Santa Fe a direct rival, as it has benchmarked the new Rexton squarely against other body on frame models. And in the Indian context that's just as well, since it is the Fortuner, and not the Santa Fe that leads the market anyway. 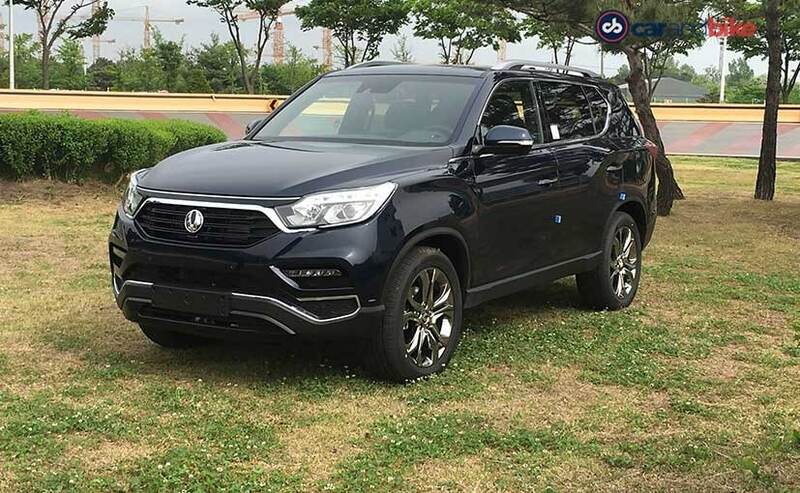 But the big question is – being new is one thing, has the company done enough to make the new 2nd generation Rexton a strong adversary to those established models? My answer to that is, yes it has. So I will be happy to welcome it back home. And if prices stay at least Rs 3 – 3.5 lakh lower than the Fortuner's, I suspect Mahindra would have a runaway success on its hands.